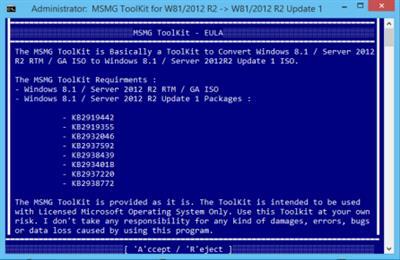 The MSMG ToolKit is basically a Toolkit to Service, Customize, Add or Remove Features and Components, Enable or Disable Features to Microsoft Windows 7-10 / ThinPC / Server 2008 R2-2012 R2 OS. Windows 7 with SP1 / 8.1 / 10 / Server 2008 R2 / Server 2012 R2 Installation Disc DVD/ISO. Windows 7 with SP1 / Windows 8.1 Host Operating System for Servicing Windows 7 / 8.1 WIM Images. Windows 10 Host Operating System for Servicing Windows 10 WIM Images. Good Computer Hardware with enough Processing Speed, RAM and Hard disk Storage Space. Download & Extract the MSMG ToolKit Archive File Contents to a folder name E.g: C:ToolKit. Download & Extract the MSMG ToolKit Packs Archive File Contents to the ToolKit's Packs Folder. Copy the Windows OS Installation DISC DVD/ISO Contents to ToolKit's DVD folder. Right Click on the "ToolKit.exe" file and choose "Run as Administrator". Choose the 1st Option "Select Source" from the Main Menu. The ToolKit will Check whether Source folder contains .ESD Image or .WIM Images. If the Source folder contains .ESD Image, then the ToolKit will offer to Convert .ESD to .WIM Image. If the Source folder contains .WIM Image, then the ToolKit will Display the List of Available WIM Image Indexes present in the Source Install WIM Image. Select the Desired Source WIM Image Index and Press Enter. The ToolKit will Mount the Selected Source WIM Image Index along with the Boot & Recovery WIM images. Choose the 2nd Option "Integrate" from the Main Menu to Integrate Updates & Features Packs to selected Source WIM Image Index. Choose the 3rd Option "Remove" from the Main Menu to Remove Features from the selected Source WIM Image Index. Choose the 4th Option "Customize" from the Main Menu to Customize Features in the selected Source WIM Image Index. Choose the 5th Option "Apply Source" from the Main Menu to Apply / Discard Changes to selected Source WIM Image Index and Re-Build Source WIM Images. Choose the 6th Option "Select Target" from the Main Menu to Make / Burn DVD ISO Image, Copy Source Folder to USB Flash Drive, Sync Source Boot & Install WIM Images to USB Flash Drive, Format USB Flash Drive. Choose the 7th Option "Options" from the Main Menu to Set Customize ToolKit's Interface Colors. Choose the 8th Option "Quit" to Exit from MSMG ToolKit. + Updated ToolKit to Service All WIM Indexes at Once. + Fixed a Bug in the Feature "Integrate WHD General Updates", Where the Updated Windows Update Client .CAB Files were not Integrated. + Fixed a Bug in the Feature "Integrate .NET Framework 3.5 Components", Where the SxS Folder Path Was Not Set Properly. + Fixed a Bug in the Feature "Integrate Data Deuplication Feature", Where the setlocal and endlocal Variables Were Not Defined. + Fixed a Bug in the Feature "Integrate WinToGo Workspace Feature", Where the setlocal and endlocal Variables Were Not Defined. + Fixed a Bug in the Feature "Integrate Microsoft DaRT Tools", Where the Toolkit Header was Missing for Error Validation Check. + Renamed the Feature "Integrate Microsoft Legacy Games" to "Integrate Microsoft Games". + Renamed Microsoft Windows Legacy Games Pack for MSMG ToolKit to Microsoft Games Pack for MSMG ToolKit. + Updated the Feature "Integrate Microsoft Games" with an Option to Choose Selected Games for Integration. + Fixed a Bug in the Feature "Integrate Microsoft Games", Where a Comment Line with a Delete Word was Causing an Invalid Drive Error. + Fixed a Bug in the Feature "Integrate Windows Sidebar", Where Folder Path Double Quotes Were Missing. + Fixed ToolKit Semantic Errors.